The Augusta Bird Club conducted its first Christmas Bird Count (CBC) for this season on December 14th. This is our club’s 48th year of participation. Eight teams, consisting of 31 club members, were out in the field for a total of 60.25 hours with total miles by car being 635.5 and 10.75 miles by foot. Two ‘owling’ teams set forth in the wee hours of the morning. In addition to garnering a few owls (Barn, Screech and Great Horned), we were treated to an additional wonder of the night, the Geminid meteor shower. It was a beautiful stellar icing to the cake! With sunrise and beautiful clear, blue skies showing themselves, we knew it was too beautiful of a day for great birding!!! Where was some bad weather to bring in more birds!?!? Male American kestrel. Photo by Greg Hume. What unfolded for the day gave us 75 species with some interesting sightings and a few records for the day including Cackling Geese (4th record), a Merlin (5th record), four Barn Owls that tied the 2011 and 1971 records and high counts for Common Merganser (6), Red-shouldered Hawk (14), American Kestrel (36) and Winter Wren (9). Totally absent for the day was a sighting of a Bald Eagle… none were to be had! We had an additional 7 species for the count week. The cumulative number of species for the Augusta CBC is 134 with 66 being the average. Last year there were over 2,400 count circles with 1,863 in the U.S. but it continues to expand in North and South America. If you have an interest in locations and numbers, all of the data eventually will be available on the Audubon website. For example, last year at a particular circle in Ecuador, they logged in a dazzling number of 531 species!!! The CBC runs from December 14th to January 5th every year. The Waynesboro CBC was held on Saturday, January 3rd. I am pleased and proud that our club continues to have dedicated members willing to participate in the annual CBCs. We do not have all the data from the CBC available, but a few notes struck me. Although we had no Snowy Owl this year, for the first time since 1995, we had a Barn Owl! We even counted two of them somewhat near each other. This marks the first year that we ever had Barn, Barred, Eastern Screech and Great Horned Owls in the same count day. 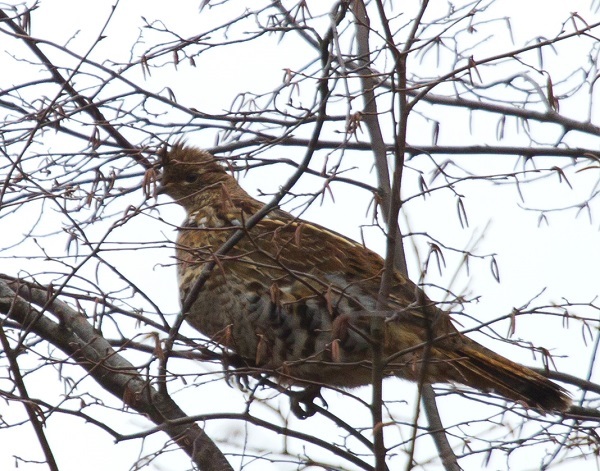 Kevin Shank’s family of Union Springs snagged our first Ruffed Grouse since 2007. A Merlin, a Peregrine Falcon and a Loggerhead Shrike rounded out some very nice birds. Count week birds included continuing Eurasian Collared Dove (Mount Solon) and Green Heron, a very unusual find for the season, reported by Karen Shank on Nazarene Church Rd. Thanks to all who were able to contribute directly and to those for helping facilitate this labor of love. January 4, 2015 in Projects.